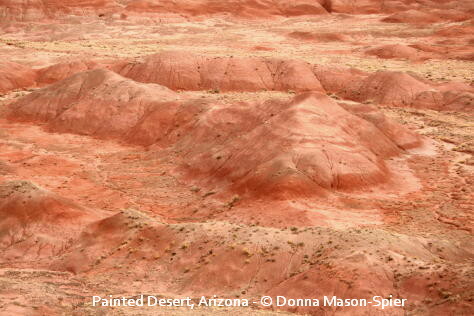 From east of the Grand Canyon, the Painted Desert crosses the Colorado Plateau in a long curving arc southeastward to encompass the Petrified Forest east of Holbrook, Arizona, and then continues into New Mexico and northeastern Arizona. 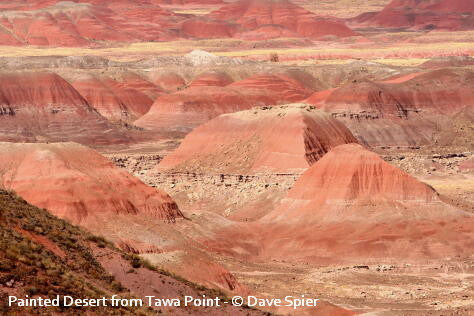 The bright colors, primarily shades of red, are due to iron oxides in the late Triassic Chinle formation deposited as clay, silt and sand in lakes and wetlands that covered a broad plain over 200 million years ago (mya). Most of these sediments are now soft mudstones and related rocks with a few harder layers of sandstone. 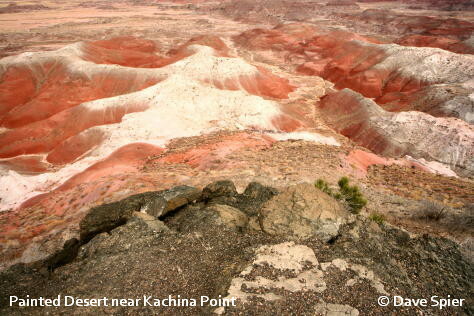 Color contrast in the northern section of the Petrified Forest is provided by a light-colored band of volcanic ash known as the Black Forest bed. The bright-colored layer on top of the low hills is volcanic ash in the Black Forest Bed, named for the unusually-dark tree trunks it contains. In the foreground, we are standing on basalt lava of the Bidahochi Formation exposed at the rim of a mesa overlooking the Painted Desert north of Kachina Point in Petrified Forest NP, AZ. 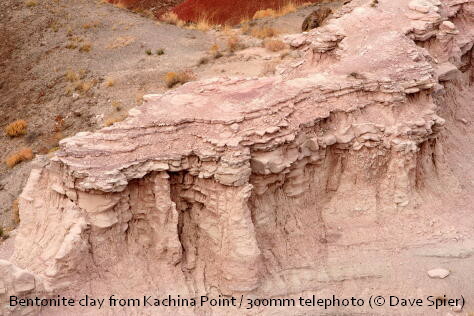 On top of the Chinle layers there are younger deposits of clay, silt and sand plus lava flows belonging to the Bidahochi Formation, much of which has been removed by erosion. These Tertiary layers can be seen from several of the overlooks north of I-40. Flat-topped mesas to the north are capped by this formation. Photography Notes: On cloudy days, the diffuse lighting makes topographic features look flat and featureless. If possible wait for a sunny day or time and choose locations where the sun will be to your side (left or right). This side-lighting creates shadows for contrast and brings out the texture and details. The effect is maximized soon after sunrise and before sunset, which are the golden times of daylight and give the warmest color tones. We were on our way to the Grand Canyon, so time constraints reduced our ability to revisit this section under better lighting conditions. There is no campground [or car camping] in the park, [although you can backpack which requires a permit], and the extra travel further reduced time for photography. 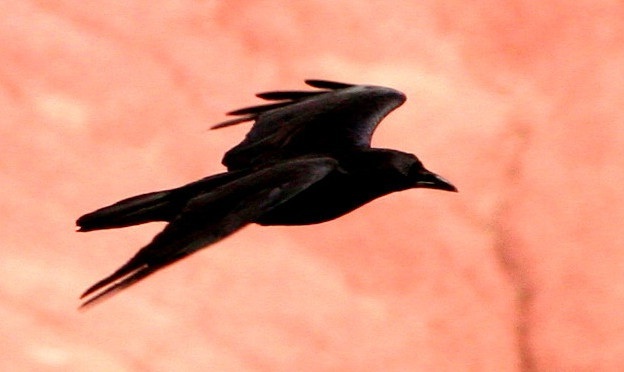 Corrections, comments and questions are always welcome at northeastnaturalist@yahoo.com or connect through Facebook (Dave Spier, photographic naturalist and northeast naturalist). This entry was posted in geology and tagged Arizona, bentonite, Bidahochi, Chinle, Formation, geology, mudstone, Painted Desert, Petrified Forest, photography, sedimentary, Tertiary, Triassic, volcanic ash. One new photo was added [volcanic ash using 300mm from Kachina Point], and a misleading reference to Miocene vulcanism was removed. At this point, I do not know the age of the lava capping the northern overlooks in the park, although it’s likely late Miocene or early Pliocene. The Bidahochi is around 4-8 million years old. A reference to 50 million year old Bidahochi layers [in one of the photo captions] by Dr. Ash may be a typographical error in his book.